Jumbo Uni-posca Markers. Sold Individually. Item PC17K. Available in 11 Vibrant Colors. Sold Individually. Oil Based Permanent Marker. Medium Line. Pointed Tip Is 1/4" in Diameter. 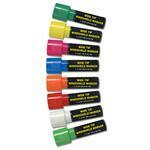 Uni-Posca Markers Are Water Based 1/4" Broad Tip, Available in Yellow, Orange, Green, Red and Pink. Sold Individually.